The computers and other electronic devices transmit the data from one to another device in the form of signals and using a transmission media. The transmission media can be fundamentally categorised into two types guided and unguided. Unguided media is a wireless communication which carries electromagnetic waves by making use of air as a medium and also in the vacuum, it can transmit data and without requiring a physical conductor. Guided media need a physical medium to transmit signals such as wires. Guided media is classified in three ways twisted pair cable, coaxial cable and fibre-optic cable. The article explains you the difference between optical fibre and coaxial cable. Essentially, the optical fibre is a guided media which transmits the signals from one device to another in the form of light (optical form). Whereas coaxial cable transmits the signals in electrical form. Basic Transmission of the signal is in optical form (light form). Transmission of the signal is in electrical form. Composition of the cable Glass and plastics Plastic, metal foil and metal wire (usually copper). Losses in cable Dispersion, bending, absorption and attenuation. Resistive, radiated and dielectric loss. Bending effect Can affect the signal transmission. Bending of wire does not affect the signal transmission. As mentioned previously the optical fibre is a type of guided media. It is made up of glass, silica and plastic, where the signals are transmitted in the form of light. Optical fibre uses the principle of total internal reflection to guide light through the channel. 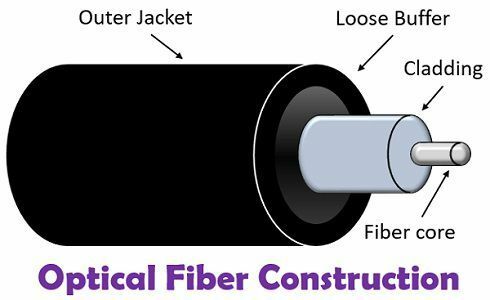 The structural composition of an optical fibre includes a glass or ultrapure fused silica surrounded by a cladding of less dense glass or plastic. The cladding is covered with a buffer either loose or tight, to protect it from moisture. Finally, the whole cable is then encased by an outer covering made by a material such as teflon, plastic or fibrous plastic etc. The density of the two materials is maintained in such a way that the light beam travelling through the core is reflected off the cladding rather than refracted into it. In the optical fibre the information is encoded in the form of a light beam as a sequence of on and off flashes that signifies 1’s and 0’s. Fibre optics cable is made up of glass and is delicate which makes it difficult to install. The repeater is placed at 2 km to 20 km depending on the type of the fibre. There is two types of optical fibre, multimode and single mode. Multimode fibre has two variations, step index and graded index fibre. LED and lasers can be used as the light source of the optical cable. In Optical fibre cable, the loss of energy takes place when the light is travelled from one place to another which is known as attenuation. The attenuation is caused when the following phenomenon takes place absorption, dispersion, bending and scattering. The attenuation depends on the length of the cable. Absorption – The light intensity gets dimmer as it travels to the end of the fibre due to heating of the ion impurities and it is known as absorption of light energy. Dispersion – When the signal goes along the fibre, it doesn’t always follow the same specific path, this makes it highly distorted. Bending – This loss occurs due to the bending of the cable, it gives rise to two conditions. In the first condition, the whole cable is bent which restricts the further reflection of the light or loss of cladding. In the second condition, only the cladding is bent slightly, resulting in the unnecessary reflection of the light in the different angles. Scattering – The loss is generated due to the varying microscopic material density or in the presence of fluctuating densities. The coaxial cable transmits the signals in the form of electrons, low voltage electricity. It is made up of a conductor (usually copper) placed at the centre or core which is surrounded by an insulating sheath. The sheath is also encased in an outer conductor of a metal braid, foil or a combination of the two. The external metallic wrapping acts as a shield against the noise and completes the circuit as the second conductor. The outer metallic conductor is also enclosed in a plastic covering to protects the whole cable. Coaxial cable is a good alternative to an ethernet cable. The coax cables are most popularly used in the cable TV to distribute the TV signals. The power loss generated by a coaxial cable is coined by the term attenuation, and it can be affected by the length and frequency of the cable, attenuation can increase as the length increases. There are also various losses generated such as resistive loss, dielectric loss and radiated loss. Resistive loss – It arises due to the resistance of the conductors, and the flowing current produces heat. The skin effect limits the actual area where the current flows, but rising frequency progressively make it more apparent. The resistive loss expands as the square-root of the frequency. Multi-stranded conductors can be used to overcome the loss. Dielectric loss – It is also another major loss arises due to the rise in frequency, but it increases linearly unlike resistive loss. Radiated loss – The Radiated loss is lesser than resistive and dielectric losses it could generate when a cable has poor outer braid. The power radiation results in interference where the signals can be present at a point where they are not needed. Optical fibre carries the signals in optical form while coaxial cable carries the signal in the form of electricity. Fibre optics cable is made of glass fibre and plastic. In contrast, the coax cable is made up of metal wire (copper), plastic and metal mesh braid. The optical fibre is more efficient than coax cable as it has higher noise immunity. Optical cable is costlier than coax cable. The effect of bending of the cable is negative in case of an optical fibre. As against, the coaxial cable is unaffected by the bending. The optical fibre provides high bandwidth and data rates. On the contrary, the bandwidth and data rates provided by the coax cable are moderately high but lesser than optical cable. Coaxial cable can be easily installed whereas installation of optical cable requires extra effort and care. The optical fibre is lightweight and has a small diameter. Conversely, a coaxial cable is heavier and has a large diameter. Noise resistance – As fibre optic cable uses light rather than electricity, noise is not an issue. External light probably could create some interference, but that is already blocked from the channel by the outer jacket. Less attenuation – The transmission distance is remarkably greater than that of any other guided media. In optical fibre cable, a signal can run for miles without needing regeneration. Higher bandwidth – Fibre-optic cable can carry higher bandwidth. Speed – It provides higher transmission rates. Cost – Optical fibre is expensive because it needs to be manufactured precisely and a laser light source costs a lot. Installation and maintenance – A rough or cracked core of the optical fibre can diffuse the light and cease the signal. All the joints must be perfectly polished, aligned and sealed light-tight. It makes use of unsophisticated tools for cutting and crimping, which makes it more difficult to install and maintain. Fragility – Glass fibre is more delicate and easily broken than a wire. Frequency characteristics – Coaxial cable has a better frequency characteristic as compared to twisted pair cable. Susceptibility towards interference and crosstalk – It is less susceptible to interference and crosstalk because of concentric construction of the cable. Signaling – Coax cable supports both analog and digital signalling. Cost – It is cheaper than optical fibre. Distance travelled by the signal – A repeater is required for every kilometre when the communicating devices are placed at a longer distance. The Optical fibre is more efficient than coaxial cable in terms of data transmission speed, noise and interference resistance, dimensions, bandwidth, losses etc. But, coaxial cable is cheaper, easily available and installed, and bending of the cable does not affect the signalling in the cable. You have shared some very useful information. Thanks for differentiating between optical fiber and coaxial cable. Keep sharing such information.